On his blog, Matt Kwid advises us that “Blaster Master,” the first track on Passive Listener, was created on his phone. Pretty ballsy way to begin, if you ask me. Using the highly regarded digital audio workstation Caustic, Kwid powers his way into your ears with full-on chipset attitude and a boppy bit of retro charm. Just when you figure that’s what you’re in for, hello, when did we drop into a Pink Floyd break? Get used to it. While Passive Listener retains a strong retro feel for most of its run, Kwid throws intriguing curveballs into the mix. It’s why the release has become one of my preferred downtime listens during the time when I’ve been waiting for its official turn to be reviewed. I’d be shuffling my queue, a catchy piece would come on and when I checked it, it was another Matt Kwid song. Honestly, there are points where it sounds like someone got a 1980s synthesizer for their birthday and wanted to try it out, but it’s also infused with the kind of unbridled joy and sense of discovery that gift would bring, and it all just works. “Waiting Room” is a shot of robotic jazz with its own stiff geometric charm. The programmed drums get a little repetitive for me, and I can only take so much of that particular tinny sound anyway, but crisp electric piano riffs and half-second vocal barks take my mind off it. “Drift” starts off sounding like it’s going to break out into a Jan Hammer theme song, morphs halfway through into something sounding like an out-take from Bowie’s “Space Oddity,” but wins you over along the way with its meaty bass melody and nostalgic appeal. All in six minutes. Then in comes the star: “Mekanism” reaches out to you through an opiate haze, between liberal use of whammy bar and sound processing. As a rhythm track that sounds for all the world like the demo mode on an old Casio keyboard thumps and clinks its way patiently along, Kwid lays in a spacey sequencer line and then drops in big doses of quivering tremolo guitar goodness. I love this track for its drunken wobble and its glossy, slack-guitar-style chords just shining up above everything. “Omission” closes the disc with more guitar taking the lead, this time dousing you in soul-soaked blues riffs. 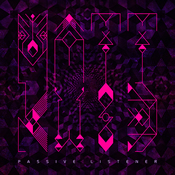 Passive Listener is just five tracks and 44 minutes long, but it certainly does what it should: it makes me want more from Matt Kwid. The retro feel and the halting approach may put some off. Even I have to admit that sometimes it sounds like a talented amateur is at the helm. But every track here is strong, fully able to catch your ear. Plus, Kwid quietly slides in a sort of evolution in the flow. We slowly move from basic electronics to jazz hints to guitar, and each new track feels like it begins with an echo of its predecessor. I can leave this on loop, and have, and it keeps me listening. Give it a try, then wait for more from Matt Kwid.